We're going to perform at Carnegie Hall in New York City! We are Louisville Male High School Band. 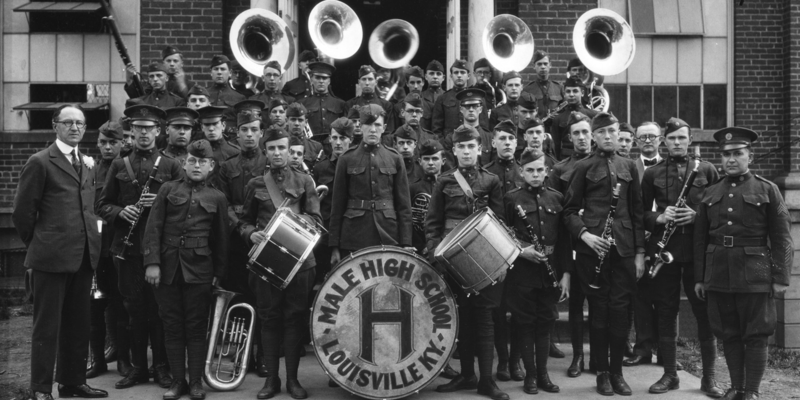 The band program at Louisville Male High School forms a vital and important part of the total high school life. It represents a large, colorful, visible, and highly disciplined segment of the school. The performance of the band at sporting events, concerts, parades, contests, as well as many community events, adds a great deal of color and life to the Louisville community. It is highly possible and expected for our members to organize their schedule in a way that allows them to maintain the high scholastic/academic achievement we expect of them. We, in the Male Band and Colorguard, are very proud of the success of our past and current members and are dedicated to enabling all of our members to reach their goals. Achieved through hard work, it is the pride of a job well done that makes our efforts worthwhile. The success of the organization will lead to the success of the individual and vice-versa. This is where we will share photos from throughout the year. Check back later for an updated gallery! The LMHS Marching Band announced the 2016 show production at our Membership Meeting April, 26. The concept for the new show titled, the caged bird sings… , draws inspiration from poet Maya Angelou’s 1969 autobiography “I Know Why the Caged Bird Sings”. The production features music from American composer Samuel Barber (1910-1981) with our wind arrangements once again created by Matt Harloff. Barber’s first Symphony, op. 9, also known as his “Symphony in One Movement”, was premiered in Rome in 1936 then had its American premiere by the Cleveland Orchestra in January 1937. The New York Philharmonic the performed the work at Carnegie Hall in March followed by the Vienna Philharmonic at the Salzburg Festival. Some of Barber’s other popular works include; Adagio for Strings, Medea (Ballet), School for Scandal, and Prayers of Kierkegaard. We look forward to a very exciting marching season and can’t wait to get started on the production! Visit the staff page for email addresses. © 2019 Louisville Male High School Band. All Rights Reserved.